For a Limited Time BLACKFIRE Polish 2 oz. sample, a BLACKFIRE Compound 2 oz. sample, and 2 5.5" Red Soft Wax Pads FREE with your purchase of this kit! Retail Value $17.96. A complete detailing kit for the car care enthusiast! The Porter Cable 7424XP - XL Pad Kit is one of our best values on the Porter Cable and its accessories. Whether you’re stocking your personal garage or starting your own detailing business, you’ll find more than enough supplies here to get you started. The Porter Cable 7424XP dual action polisher is the most user-friendly and foolproof polisher currently on the market. With a random orbital action, there is virtually no risk of marring the paint surface with this machine. Everyone from beginners to seasoned enthusiasts will create beautiful results with the Porter Cable 7424XP. The kit includes foam pads by Lake Country, the maker of our CCS Smart Foam Pads. The foam buffing pads feature hook & loop backing to enable quick pad changes. They are a perfect fit on the 5” Flexible Hook & Loop backing plate included in this kit. I recommend having more than one of each type of pad on hand as you’re detailing. When the foam pad you’re using becomes caked with polish, you can quickly switch to a clean pad and keep working. Not to mention, your polishing and swirl remover foam pads generally work harder than your finishing pads and may wear out faster. 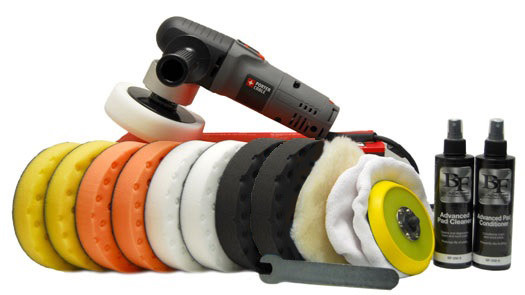 The Porter Cable 7424XP - XL Foam Pad Kit gives you two each of the orange light cutting, yellow cutting, and white polishing foam pads to try and balance the wear time with the finishing pads. Of course, everyone’s needs are different. That’s why we offer several different foam pad kits that work with the Porter Cable 7424XP. Check out our Porter Cable 7424XP page for more kit options. Constructed of flexible urethane, this 5 inch backing plate has hook and loop material permanently secured from edge to edge. A recessed edge protects the paint from impact and the post is made of durable stainless steel. The 5/16 inch thread fits any dual action polisher with a corresponding thread. Use this pad to apply compounds or polishes to remove severe oxidation, swirls, and scratches. It is the most aggressive and should not be used on new or like-new paint finishes. Always follow this pad with an orange light cutting pad and a fine polish and then a white pad to refine the paint until it is smooth. Firm, high density foam for scratch and defect removal. Use this light cutting foam pad with polishes and swirl removers. It’s an all around pad that will work on most light to moderate imperfections. Composition is firm enough to withstand added pressure during final finishing to remove buffer swirls. The Black finishing pad has no cut and will apply thin, even coats of waxes, sealants, and glazes. These six-inch microfiber bonnets are well-made, reversible, and machine washable. With a 70/30 blend, they are super soft and gentle on all paint finishes. Cover your foam pad directly or layer them over the lamb’s wool leveling pad for a more cushioned application. Either way, they are superior at applying products, polishing and shining. The lambswool pad is best used as a cushion underneath a bonnet on your Porter Cable 7424XP. The wool pad serves as a barrier between the bonnet and the backing plate. Unlike foam pads that can be crushed under a bonnet, the lambswool pad retains its shape and can be used for light compounding if you desire. The Porter Cable 7424XP – XL Pad Kit is a complete detailing package with every kind of pad you might need. When you discover its time to replace the pads, check out the Dual Action 6.5” Foam Pad Kit. With four of the most commonly used pads, it’s a great refill kit for the Porter Cable 7424 – XL Pad Kit. A total retail value of $304.97, you save $34.98 off the regular retail price! Super machine, takes all the fear out of the polishing process. My Porter Cable 7424XP and the XL pad kit came in faster than expected. The 7424XP is light weight making hours of buffing easier on the arms yet it has plenty of power when you need to bear down. I have had several other brands of polishers over the years and this has been the best one by far. Amazing kit for starting my small business up. I am 75 years old and own a motor home. Without this kit I would not be able to attack a project of the size of an RV. I started with a small pick-up truck, and was very pleased. The truck looks great and I am now ready to tackle the RV.